Portrait of Luca Pacioli, traditionally attributed to Jacopo de' Barbari, 1495 (attribution controversial). Fra Luca Bartolomeo de Pacioli (sometimes Paccioli or Paciolo; c. 1447 – 19 June 1517) was an Italian mathematician, Franciscan friar, collaborator with Leonardo da Vinci, and an early contributor to the field now known as accounting. He is referred to as "The Father of Accounting and Bookkeeping" in Europe and he was the first person to publish a work on the double-entry system of book-keeping on the continent. He was also called Luca di Borgo after his birthplace, Borgo Sansepolcro, Tuscany. Luca Pacioli was born between 1446 and 1448 in the Tuscan town of Sansepolcro where he received an abbaco education. This was education in the vernacular (i.e., the local tongue) rather than Latin and focused on the knowledge required of merchants. His father was Bartolomeo Pacioli; however, Luca Pacioli was said to have lived with the Befolci family as a child in his birth town Sansepolcro. He moved to Venice around 1464, where he continued his own education while working as a tutor to the three sons of a merchant. It was during this period that he wrote his first book, a treatise on arithmetic for the boys he was tutoring. Between 1472 and 1475, he became a Franciscan friar. Thus, he could be referred to as Fra ('Friar') Luca. In 1475, he started teaching in Perugia, first as a private teacher, from 1477 holding the first chair in mathematics. He wrote a comprehensive textbook in the vernacular for his students. He continued to work as a private tutor of mathematics and was instructed to stop teaching at this level in Sansepolcro in 1491. In 1494, his first book, Summa de arithmetica, geometria, Proportioni et proportionalita, was published in Venice. In 1497, he accepted an invitation from Duke Ludovico Sforza to work in Milan. There he met, taught mathematics to, collaborated, and lived with Leonardo da Vinci. In 1499, Pacioli and Leonardo were forced to flee Milan when Louis XII of France seized the city and drove out their patron. Their paths appear to have finally separated around 1506. Pacioli died at about the age of 70 on 19 June 1517, most likely in Sansepolcro where it is thought that he had spent much of his final years. Tractatus mathematicus ad discipulos perusinos (Ms. Vatican Library, Lat. 3129), a nearly 600-page textbook dedicated to his students at the University of Perugia where Pacioli taught from 1477 to 1480. The manuscript was written between December 1477 and 29 April 1478. It contains 16 sections on merchant arithmetic, such as barter, exchange, profit, mixing metals, and algebra. One part of 25 pages is missing from the chapter on algebra. A modern transcription has been published by Calzoni and Cavazzoni (1996) along with a partial translation of the chapter on partitioning problems. Summa de arithmetica, geometria. Proportioni et proportionalita (Venice 1494), a textbook for use in the schools of Northern Italy. It was a synthesis of the mathematical knowledge of his time and contained the first printed work on algebra written in the vernacular (i.e., the spoken language of the day). It is also notable for including one of the first published descriptions of the bookkeeping method that Venetian merchants used during the Italian Renaissance, known as the double-entry accounting system. The system he published included most of the accounting cycle as we know it today. He described the use of journals and ledgers, and warned that a person should not go to sleep at night until the debits equalled the credits. His ledger had accounts for assets (including receivables and inventories), liabilities, capital, income, and expenses — the account categories that are reported on an organization's balance sheet and income statement, respectively. He demonstrated year-end closing entries and proposed that a trial balance be used to prove a balanced ledger. He is widely considered the "Father of Accounting". Additionally, his treatise touches on a wide range of related topics from accounting ethics to cost accounting. He introduced the Rule of 72, using an approximation of 100*ln 2 more than 100 years before Napier and Briggs. De viribus quantitatis (Ms. Università degli Studi di Bologna, 1496–1508), a treatise on mathematics and magic. Written between 1496 and 1508, it contains the first reference to card tricks as well as guidance on how to juggle, eat fire, and make coins dance. It is the first work to note that Leonardo was left-handed. De viribus quantitatis is divided into three sections: mathematical problems, puzzles, and tricks, along with a collection of proverbs and verses. The book has been described as the "foundation of modern magic and numerical puzzles", but it was never published and sat in the archives of the University of Bologna, where it was seen by only a small number of scholars during the Middle Ages. The book was rediscovered after David Singmaster, a mathematician, came across a reference to it in a 19th-century manuscript. An English translation was published for the first time in 2007. Geometry (1509), a Latin translation of Euclid's Elements. Divina proportione (written in Milan in 1496–98, published in Venice in 1509). Two versions of the original manuscript are extant, one in the Biblioteca Ambrosiana in Milan, the other in the Bibliothèque Publique et Universitaire in Geneva. The subject was mathematical and artistic proportion, especially the mathematics of the golden ratio and its application in architecture. Leonardo da Vinci drew the illustrations of the regular solids in Divina proportione while he lived with and took mathematics lessons from Pacioli. Leonardo's drawings are probably the first illustrations of skeletal solids, which allowed an easy distinction between front and back. The work also discusses the use of perspective by painters such as Piero della Francesca, Melozzo da Forlì, and Marco Palmezzano. As a side note, the "M" logo used by the Metropolitan Museum of Art in New York City is taken from Divina proportione. The majority of the second volume of Summa de arithmetica, geometria. Proportioni et proportionalita was a slightly rewritten version of one of Piero della Francesca's works. The third volume of Pacioli's Divina proportione was an Italian translation of Piero della Francesca's Latin writings On [the] Five Regular Solids. In neither case, did Pacioli include an attribution to Piero. He was severely criticized for this and accused of plagiarism by sixteenth-century art historian and biographer Giorgio Vasari. R. Emmett Taylor (1889–1956) said that Pacioli may have had nothing to do with the translated volume Divina proportione, and that it may just have been appended to his work. However, no such defence can be presented concerning the inclusion of Piero della Francesca's material in Pacioli's Summa. 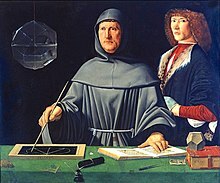 Pacioli dramatically affected the practice of accounting by describing the double-entry accounting method used in parts of Italy. This revolutionized how businesses oversaw their operations, enabling improved efficiency and profitability. The Summa's section on accounting was used internationally as an accounting textbook up to the mid-16th century. The essentials of double-entry accounting have for the most part remain unchanged for over 500 years. "Accounting practitioners in public accounting, industry, and not-for-profit organizations, as well as investors, lending institutions, business firms, and all other users for financial information are indebted to Luca Pacioli for his monumental role in the development of accounting." The ICAEW Library’s rare book collection at Chartered Accountants' Hall holds the complete published works of Luca Pacioli. Sections of two of Pacioli's books, 'Summa de arithmetica' and 'Divina proportione' can be viewed online using Turning the Pages, an interactive tool developed by the British Library. Luca Pacioli also wrote an unpublished treatise on chess, De ludo scachorum (On the Game of Chess). Long thought to have been lost, a surviving manuscript was rediscovered in 2006, in the 22,000-volume library of Count Guglielmo Coronini. A facsimile edition of the book was published in Pacioli's home town of Sansepolcro in 2008. Based on Leonardo da Vinci's long association with the author and his having illustrated Divina proportione, some scholars speculate that Leonardo either drew the chess problems that appear in the manuscript or at least designed the chess pieces used in the problems. ^ "THE ENIGMA OF LUCA PACIOLI'S PORTRAIT". RitrattoPacioli. Retrieved 30 January 2015. ^ Di Teodoro, Francesco Paolo (2014). "PACIOLI, Luca". Dizionario Biografico degli Italiani (in Italian). 80. Treccani. Retrieved 30 January 2015. ^ MacKinnon, Nick (1993). "The Portrait of Fra Luca Pacioli". The Mathematical Gazette. 77 (479): 132, 160. doi:10.2307/3619717. ^ a b c "Pacioli biography". www-groups.dcs.st-and.ac.uk. Retrieved 24 March 2016. ^ McDonald, Lucy (10 April 2007). "And that's renaissance magic ..." The Guardian. Retrieved 30 January 2015. ^ The Met Store (Metropolitan Museum of Art shopping catalog), "Renaissance 'M' Bookmark" The Museum claims this origin in its descriptions of many souvenir items decorated with this logo, which it calls the "Renaissance M". ^ Smith, Murphy (2018). "Luca Pacioli: The Father of Accounting". Rochester, NY. doi:10.2139/ssrn.2320658. ^ "Turning the Pages: ICAEW's collection of rare books". ICAEW.com. ICAEW. Retrieved 18 October 2018. Bambach, Carmen (2003). "Leonardo, Left-Handed Draftsman and Writer". New York: Metropolitan Museum of Art. Retrieved 2 September 2006. Calzoni, Giuseppe and Gianfranco Cavazzoni (eds.) (1996) Tractatus Mathematicus ad Discipulos Perusinos, Città di Castello, Perugia. Galassi, Giuseppe. "Pacioli, Luca (c. 1445-c.1517)." In History of Accounting: an International Encyclopedia, edited by Michael Chatfield and Richard Vangermeersch. New York: Garland Publishing, 1996. pp. 445–447. Gleeson-White, Jane, "Double Entry: How the Merchants of Venice Created Modern Finance," New York: Norton, 2012. Heeffer, Albrecht, "Algebraic partitioning problems from Luca Paccioli’s Perugia manuscript (Vat. Lat. 3129)" in Sources and Commentaries in Exact Sciences, (2010), 11, pp. 3–52. Pacioli, Luca. De divina proportione (English: On the Divine Proportion), (Antonio Capella) Venice: Paganino Paganini (1509). Smith, Murphy, Luca Pacioli: The Father of Accounting (2018). Available at SSRN: https://ssrn.com/abstract=2320658 or https://dx.doi.org/10.2139/ssrn.2320658. Wikimedia Commons has media related to Luca Pacioli. Online Galleries, History of Science Collections, University of Oklahoma Libraries High resolution images of works by and/or portraits of Luca Pacioli in .jpg and .tiff format.